The ground area of the site on Niagara Square is 71,700 square feet, making it one of the largest city halls in the country. It takes 10 days to clean the windows! There are 1,520 windows from the first to the twenty-fifth floor. An interesting design feature is that all of them open inward, making window washers obsolete in the new City Hall. 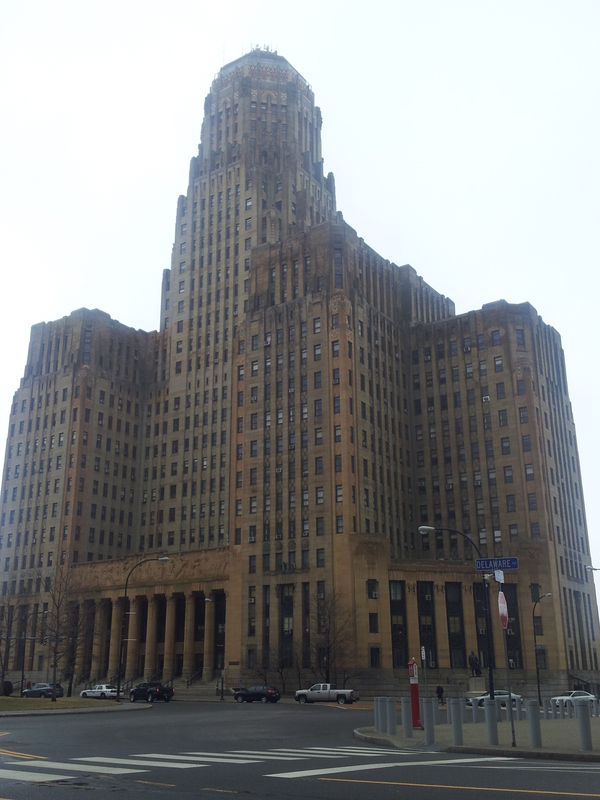 Its design took into account that Buffalo, in the 1920’s, was a growing city and would eventually need to expand. Thus, most interior walls were designed to be moved and the exterior was built to have more floors added. The caissons that support the entire structure were sunk far deeper than they needed to be. All of this made it easy for John Wade to draw, during an interview in February 1927, a view of what City Hall might look like in 2427 AD (five hundred years). Take the elevator to the 25th floor observation deck!! This entry was posted in Hearding Around and tagged Buffalo City Hall. Bookmark the permalink.